An Israeli soldier cries as a Palestinian woman pleas for her olive trees not to be destroyed. Photo EAPPI/A. Morgan. A loud buzz of chainsaws greets our arrival following a call from Tuqu’ – a Palestinian village of about 12,000 people, south of Bethlehem in the West Bank. 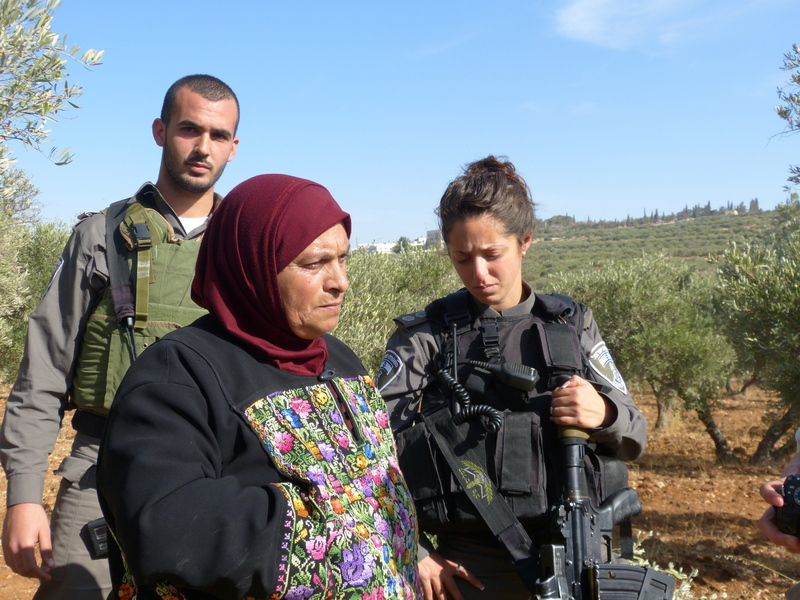 We find Israeli soldiers overseeing the destruction of row after row of mature olive trees. The Palestinian farmers remonstrate with the army. They have land ownership documents dating back generations from the Jordanian, British and Ottoman administrations, but soldiers ignore their arguments and hold them back at gunpoint. I notice a woman pleading with soldiers who order her away, but she will not let up. An Israeli Border Guard, a young woman who speaks Arabic, is called to deal with her. I watch as the young soldier stands listening and silently drops her head, turning her face to wipe away tears. Finally, the buzzing stops, but it is a temporary reprieve. The Israelis have declared this ‘state land’ and the farmers are given four days to cut down hundreds more trees themselves, or the world’s fourth largest army will return to defend Israel from the olive trees. About three quarters of Tuqu’s land is in Area C, under full Israeli military control, although Israel was supposed to give the Palestinian Authority full control of this area within 5 years of the Oslo Agreement. Tuqu’ has already lost hundreds of hectares to the illegal Israeli settlements of Teqoa, Noqedim and Ma’ale Amos that surround it to the north, south and east. Our team comes regularly to Tuqu’. It is one of four Bethlehem villages where we accompany children to school as part of a UNICEF ‘Access to Education’ programme. Every day, children of 6 to 18 must run the gauntlet of armed Israeli soldiers and we have been present when the army shot tear-gas at the schools. The soldiers obstruct the school entrances with jeeps, and patrol the footpaths with guns, forcing the children to walk across rough fields or along the busy road. ‘It is emotional harassment’ says the mayor. Recently we met a 16 year old boy who showed us the X- ray of a bullet still lodged in his back since a recent military incursion into Tuqu’. The mayor also tells us that over 20 children have been arrested in the last three months. The Israeli forces set up concrete blocks and new warning signs. Photo EAPPI/A. Morgan. Two weeks before the trees were cut down, Tuqu’s mayor called us because Israeli settlers, accompanied by soldiers, began putting up Israeli flags and tents on Tuqu’ land each afternoon. 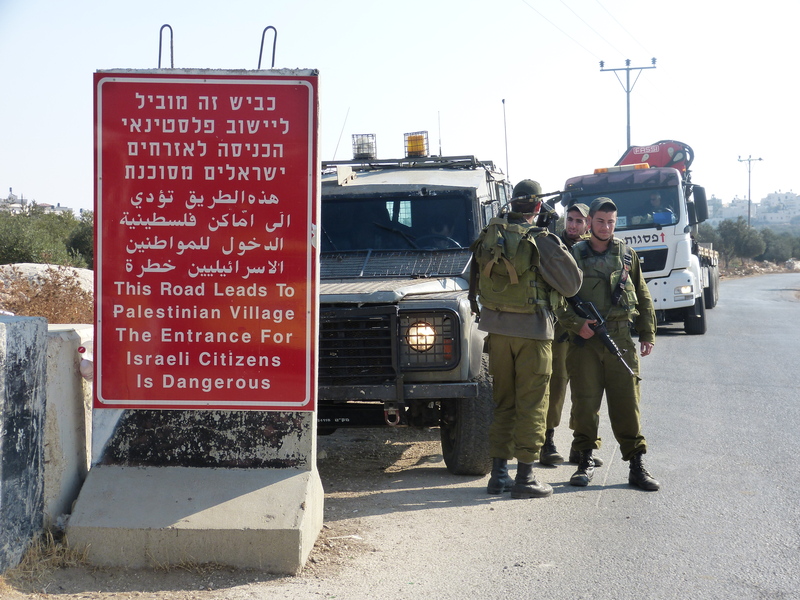 Following this we saw the army erecting a series of concrete pillars along the roadside, with two red signs warning Israelis that this was a dangerous Palestinian village. Soon after this, settlers erected a large marquee and put up provocative posters with a picture of a car being fire-bombed. The Palestinian landowner protested, but the military commander told him the settlers would have the land for two days for a party. There was nothing the farmer could do to stop this, but the village held a peaceful protest, whilst a large Israeli military force guarded the settlers. The people of Tuqu’ know that this is how it starts; a few tents, some flags, then some caravans – an illegal settlement outpost is born. With Israeli state protection and financial inducements it will soon grow to thousands of settlers. More land theft, house demolitions, movement restrictions and violence against local Palestinians will follow. Two days after the party, the settlers are back. They include a vigilante group called Women in Green* led by a Belgian-born woman called Nadia Matar. We ask what she thinks about the 16 year old Tuqu’ boy who was shot it the back whilst going to visit his grandfather. Children at non-violent protest in Tuqu’. Photo EAPPI/A. Morgan. During a visit to Tuqu’ a week after the tree cutting, we see scores of settlers coming towards the village, many bringing young children. A large number of Israeli soldiers position themselves across the road and fields, aiming their rifles and teargas cannons at Palestinian children coming out with their parents for another peaceful protest. The settlers hold a ceremony and light candles. It is Hanukkah, and they tell us they are giving this area a new Hebrew name. Under international law it is illegal for Israel, as an occupying force, to transfer its own population into the occupied Palestinian territories. Despite this, Israel’s massive settlement programme has continued unabated for decades, with thousands more homes being planned during the current Peace talks. With many settlements to the east of Bethlehem and other Palestinian centres, the Israeli strategy seems clear: to expand the eastern settlements westward to join up with Jerusalem, bisecting the West Bank and corralling the Palestinian population into a series of isolated areas. EAPPI is keeping international agencies informed about these developments in Tuqu’ and a legal challenge is underway, supported by UNOCHA and the Norwegian Refugee Council. *Women in Green (WiG) is a right wing group that opposes the creation of a Palestinian state and supports Israeli settlement of the West Bank, which it proposes Israel should annex. WiG also opposed Israeli withdrawal from southern Lebanon. Nadia Matar, the Belgian-born leader of WiG claims that the ‘Arabs’ in the ‘Holy Land’ are descended from relatively recent immigrants, and should be ‘transferred’ to neighbouring Arab countries. 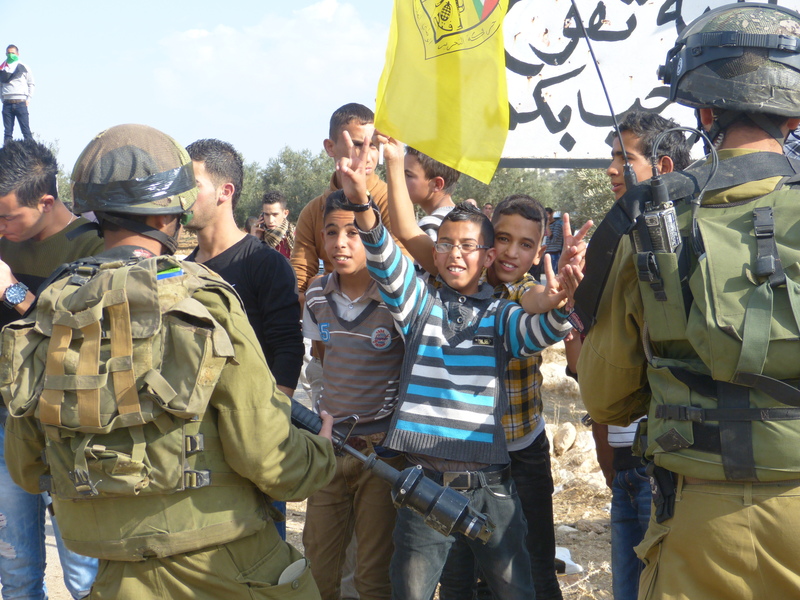 This entry was posted in Children, Settlements and tagged access, area c, bethlehem, education, israeli army, land confiscation, non-violent protest, olive trees, settlement outpost, settlements, southern west bank, tear gas, Tuqu' by EAPPI. Bookmark the permalink.